You know what we always say about wine cellars — they look best when custom made. Custom wine cellars are your best bet when you want to stand out, not to mention provide the best storage system for your wines. With custom cellars, you get to pick your own wood, different wine racking styles, wine accessories, lighting, refrigeration system, wine cellar doors and more! Of course when you want something built according to your taste, needs and budget, you need to work with someone who truly understands your needs. Today’s wine cellar is a masterpiece of our Boston wine cellar dealer. First of all, we love the mysterious cavern like look and feel of this room. 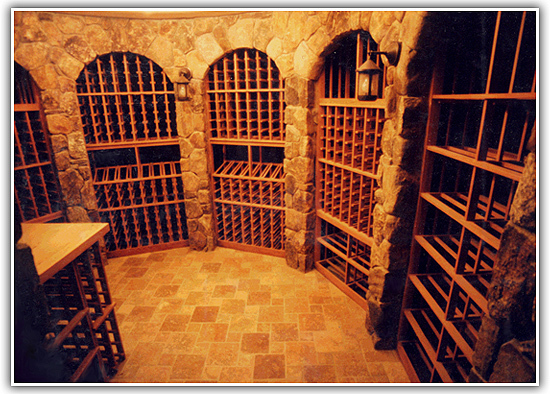 Fabulous All Heart Redwood wine racks take center stage in this cellar, placed in between lovely stone arches. All Heart Redwood is beautiful unstained, and is considered the best wood for a wine cellar. Wine racks made from Redwood truly stand out. Whether they are stained or not, they look amazing! We’re loving the stone tile flooring that matches the stone arches. Rectangular bin wine racks combined with individual storage and high reveal display racks have never looked this good, and those sconces add just the right amount of flair this wine cellar needs. Lighting is a very important part of building a custom wine cellar, and in this case, the sconces on the arches complete this wine room’s old world feel. While not visible on this photo, this wine cellar also features an adjustable shelf cabinet and a glass rack and beam support. You see what we mean about the benefits of custom wine cellars? You can add as many elements as you want – you can have cabinets custom-made, you can have your floors and ceilings custom made, and you can even add works of art! Surely you have pictured your very own wine cellar. Make sure you work with an expert who can build the wine cellar you want – just the way you picture it!